When rapper Mommy Son stepped out of his van and strolled along a street in the trendy Seoul neighborhood of Mangwon-dong, young passersby held their phones and started to take pictures. “Don’t let them take photos when the mask is off!” the rapper’s manager said, trying his best to keep the rookie artist’s true identity a secret. 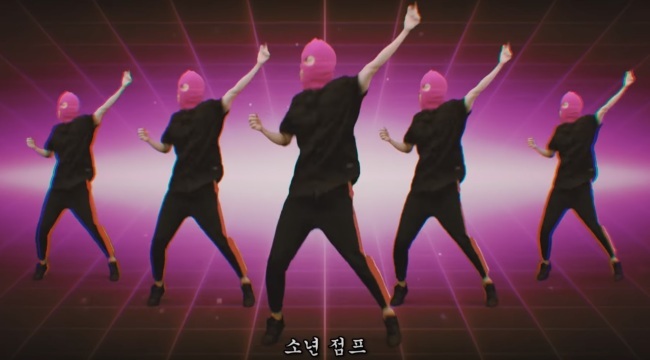 It has only been a month since masked rapper Mommy Son made his debut via Mnet’s rap competition “Show Me the Money 777,” the mysterious Korean rapper has achieved prominence with his eccentric, comic and unpredictable image. 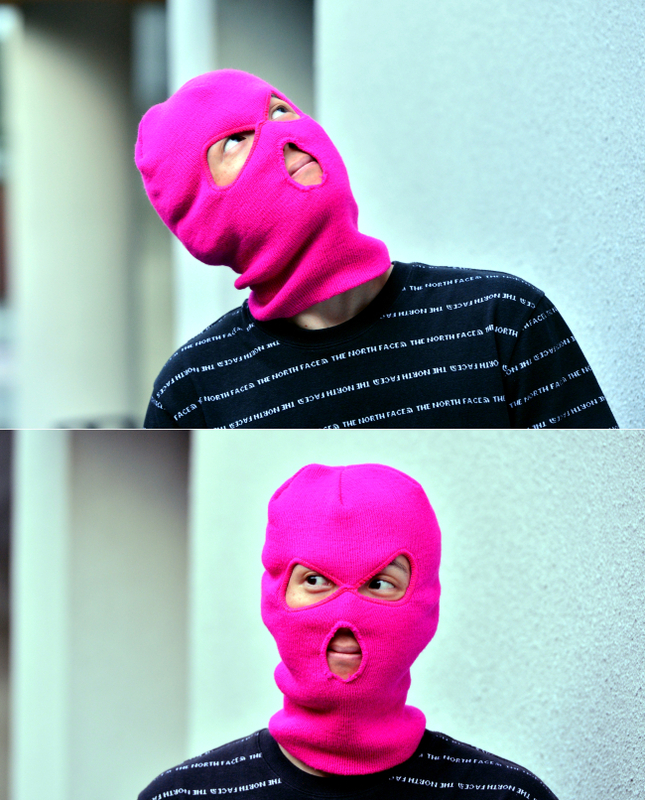 The pink balaclava was loud enough to grab the judges’ attention, but it was his rapping voice that stunned the audience. “There are so many sides of myself in me, but I have felt limited (in expressing them,)” Mommy Son said on a stage ahead of the competition’s first mission. Sitting in a nearby cafe, the rapper explained further about on the concept of Mommy Son. “I have always been eager to express my other self while I carved out my music career,” Mommy Son said. The rapper said such radical changes often end up in failures when listeners are not ready to embrace them, but Mommy Son said he had to quench his desire for new styles. Instead, he says, it gets stronger as time goes by. 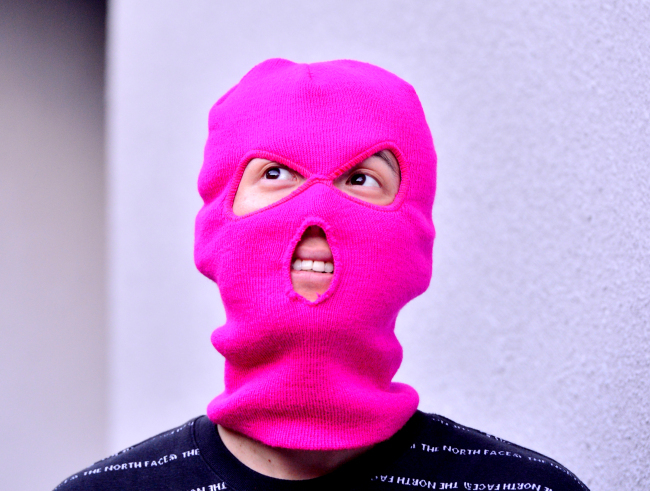 Inspired by the artist’s favorite hip-hop artist MF Doom, best known for his “super villain” stage persona that includes an iron mask, the rapper made a cheaper version of the mask with a pink beanie. 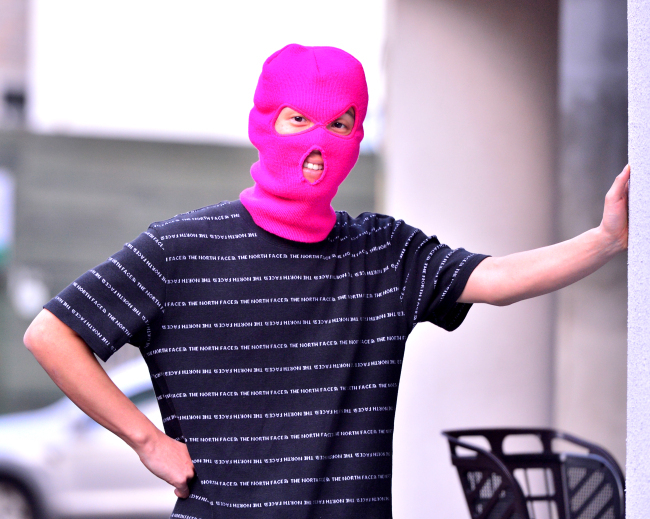 As the mask’s bright pink color matched that of Mommy Son, a popular brand of rubber gloves, the rapper chose it as his stage name. He says he hasn’t planned out his next step, or what image he would pursue as Mommy Son. Instead, he has been trying to do what he wants to do at the time, without caring what other people think. One of the things he wanted to do was to perform in the final stage of the “Show Me the Money 777.” The first episode of the rap competition show shows the debut of the masked rapper, who says his confidence is boosted when his face is covered. But Mommy Son was eliminated after forgetting his lyrics onstage. “In fact, I felt extremely nervous and overwhelmed while standing in front of the villains,” Mommy Son recalled, comparing the judges to villains who dropped him from the competition. The rapper refused to elaborate on whether he made the slip in purpose or not, but he has turned his failure into an opportunity with a clever twist. One day after his onstage mistake was aired, Mommy Son released a video of his new track titled “Sonyun Jump” on YouTube. In the two-minute song, he shouts “You think I’ll fail here? The hero of this cartoon never dies!” and “This is just like a total classic cliche. The hero suffers in the beginning, but this was for the boost (to be on a roll)!” indirectly referring the failure he made on the competition show. The highlight lyrics of the song, “Korean Hip-hop, go to hell!” have no further meaning other than the fury he felt toward being turned down on the competition, Mommy Son confessed with laughter. The song’s addictive melody and video’s comical footage have drawn more than 21 million views on the video streaming platform as of Oct. 17. Filming a music video is often very energy consuming and stressful, but shooting for the “Sonyun Jump” video was more like “going on a picnic with close friends,” Mommy Son said. Mommy Son added that he had a hunch of song’s big success on the moment he filmed the scene that he walks down a stone bridge, as he felt some odd energy comes into his body. So far, the rapper has not been exposed much to the public besides his rare activities on Instagram, YouTube and Sound Cloud. “I’m going to drop few songs on November and they will explain everything of Mommy Son,” the rapper wrote on Instagram, raising anticipation among fans waiting for his return. “The character Mommy Son is a form of art for me, but at the same time, it is a huge metaphor for social phenomena. I can’t elaborate more with few words for now, but you’ll get to understand the meaning if you watch a video that I’m releasing in November,” Mommy Son hinted during the interview. When asked about his thoughts on the public’s speculation as to his real identity, Mommy son answered it is fun to observe them and he would like to tease people more. When the interview nearly ended, the owner of the Mangwon-dong cafe shyly asked the rapper to take a picture with him, introducing himself as a huge fan of Mommy Son with a big smile that he couldn’t hide. It seems that the rapper has already accomplished one of his goals.